Superintendent, Dr. Michael Tefs, was recently awarded the 2019 Community Service Award for his advocacy efforts during the Wooster Boys & Girls Club’s (BGC) annual Youth of the Year Dinner and Auction. The event took place on Saturday, April 13, at the Shisler Conference Center in Wooster. The Wooster Way’s mission is empowering the heart, body, and mind. The umbrella symbolizes the services we offer throughout the district to help our students. Please note that not all of the programs that are under the umbrella are offered district wide, some are just building(s) specific. Ohio is committed to the implementation of a unified state system of support directly focused on improving the academic achievement of all students and student groups. The Ohio Improvement Process (OIP) articulates a systemic and coherent approach to improving districts and schools not just for the short term but rather by changing fundamental structures and processes that will lead to sustainable improvement. 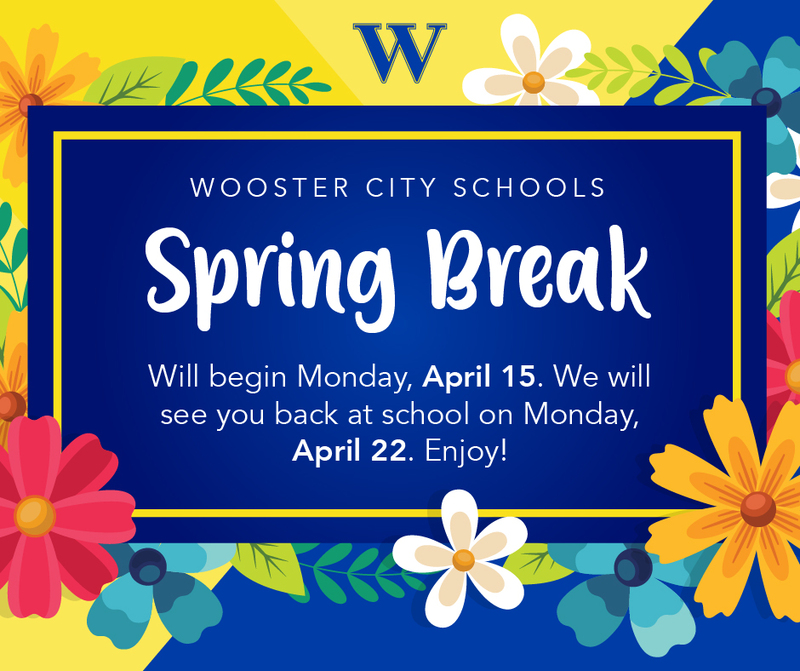 In the Wooster City School District, we are proud and happy to tell the story of the history of our colors. The video at this link tells the story of revered community member Stanley Gault and the pride he had for the Wooster City Schools' Blue and Gold! The Wooster City School District is the largest school system in the Tri-County (Ashland, Holmes, Wayne) area. Our 4,100 students live in an economically diverse community where the residents are dedicated to ensuring that each and every student achieves success. The school district, located in the heart of Wayne County, is an innovative school district that consists of four PreK-4 elementary schools, an intermediate school for grades 5-7, and our award winning and regionally recognized high school that serves grades 8-12. Wooster High School is home to the Tri-County International Baccalaureate (IB) Academy, 21 College Board Advanced Placement courses, the General’s Academy (digital, blended learning environment) and our Science, Technology, Engineering, Mathematics (STEM) program, Project Lead The Way. The Wooster City School District and Board of Education have made communication a priority. Please visit the link below to find out the various ways in which you can receive district updates and notifications. Wooster, Ohio, home to 26,540 residents and counting, is a lively hub for innovation, business, and entertainment. Serving as the county seat and dairy capital of the State, the community boasts an excellent school system, a vibrant downtown, three colleges, a world-class community-owned hospital, a portfolio of growing businesses serving the global economy, and a network of volunteers and organizations dedicated to helping individuals succeed. Named one of Ohio's Best Hometowns in 2017, Wooster continues to be one of Ohio's most innovative and exciting communities to live, work, and visit!